Full suspension ain't for everyone and there are plenty of shenanigans to be had with a hardtail like the Giant Fathom 2 Complete Mountain Bike. Aside from the weight savings and simplicity of components, this ALUXX SL aluminum frame is durable and light. Spearheading your ride is a 120mm Suntour Radion for added stability while a pair of Tektro brakes modulate your speed. A proven Shimano Deore drivetrain shifts through climbs with ease, while transitions are easy thanks to the included dropper post. 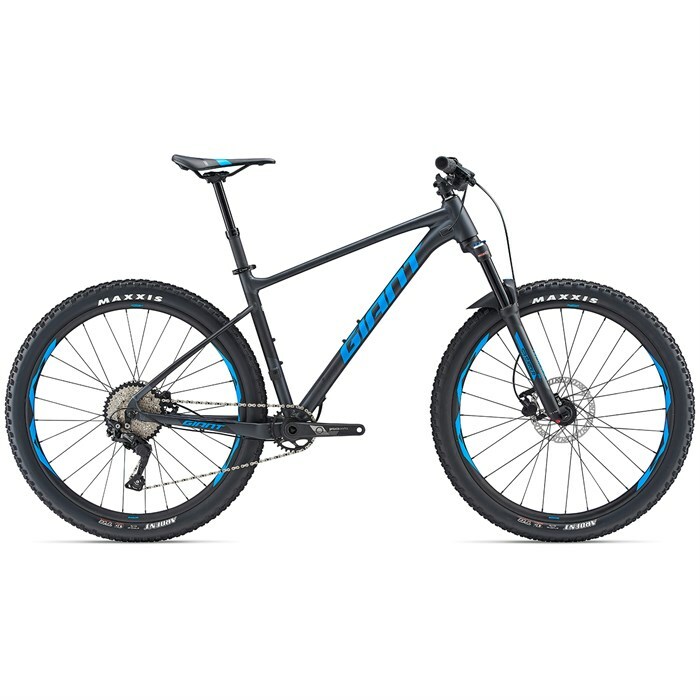 The Giant Fathom 2 Complete Mountain Bike awaits your favorite trails, secret singletrack, and beyond. Maxxis Ardent Tires  An aggressive tread in high-volume casing, designed with great traction in mind. The Ardent doesn't forget the racer with large block-style side knobs offering numerous edges for high-speed cornering. The center tread, while ideal for braking and accelerating traction, also features ramped knobs to minimize rolling resistance. Tires: Maxxis Ardent Race Folding 60tpi TR | 27.5 x 2.4"